Over the past few decades, there have been many books and teachings on Spiritual Warfare. Those that entered into actively living by those teachings found the task much more challenging than they could have ever imagined. There seemed to be something missing in the concepts taught that left gaping holes in their defenses. It is time to return to the Book of Acts and realize that the Early Church flowed in Hebraic truths and a Hebraic mindset. Because they realized that they had been engrafted into Israel and its rich Hebraic heritage, they were able to move in a level of authority and protection that the modern church has yet to demonstrate. It is time to discover our Hebraic heritage and its place within the life of the believer. Then we can learn how to build solid defenses against the onslaughts of the enemy of our souls! 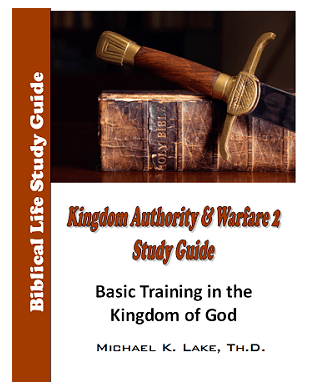 In this second study guide, you will find the detailed lecture outlines for the Biblical Life College and Seminary Course: Kingdom Authority & Warfare 2. This course covers from a Hebraic perspective: the armor of the believer, the power of repentance, ministry of intercession, the weight of fasting, the power of praise, understanding the anointing and the sevenfold anointing of the Holy Spirit for leadership. Any student of the Word will walk away from this course with a deeper understanding of the weapons available to him and how to use them to achieve victory in every area of life! The study guide is professionally printed 8 1/2″ x 11″ perfect bound paperback (151 pages) and is accompanied by sixteen lectures on CD (each teaching is a minimum of 1 hour long).